Many journalists in the Polish press have speculated about how a Barack Obama presidential win might affect Poland, the EU, the world and perhaps the galaxy. With this said, few have picked up on the abstract hypothetical potentiality that American conservatives could very well start chartering jets and boarding steamships headed for Polska, much like the supposed hordes of liberals fled the Bush administration to go to Canada. 1) Poland has been one of the U.S.’s closest allies in the War on Terror in Iraq and Afghanistan and is also a NATO ally. 2) Poland is now in bed with the U.S. military after signing the missile defence shield agreement. 3) There is a strong pro-business faction in the Polish Parliament that oversaw a 6.5 percent increase in GDP in 2007. 4) Poland is a religiously devout nation and the population is overwhelmingly socially conservative. 5) Most importantly perhaps, Poles have one of the most favourable opinions of the U.S. in Europe (in spite of the fact that Poland has been perennially kept off of the visa-waiver list). When you look at it on paper you have to admit that Wilson might be on to something. Each of his points are in keeping with core Republican values. Whether it is actually worth speculating as to whether an Obama win would find the “love it or leave it” set eating their own words is quite another issue. So in the spirit of excessive analysis, self-indulgent punditry and infinite what-ifery, I will humour Wilson for a moment and explore the comically cataclysmic results of a wave of American conservative ex-pat migration to Poland. Republicrats: These are the middle of the roaders that are not exactly pleased with the way Commander Bush has run the show these last eight years and are sceptical about the implications of a McCain presidency, but wouldn’t be caught dead actually voting for a Democrat – much less an African-American – due to family connections, job concerns and peer pressure. They would fit in just fine considering the mutually fractured Polish political landscape, but probably wouldn’t last very long due to family connections, job concerns and peer pressure. Neocons: Bush and his cronies ushered in a revolution in many senses with their bold yet flawed military economic policies and their willingness to suspend civil liberties. President Lech Kaczynski has been one of Bush’s closest allies and biggest admirers. As long as they move close to the new missile base and hang around with their PiS pals they should be all right. If Russia were to start causing trouble again they would be in absolute heaven. Ridiculously wealthy businessmen: The Republican party has been the party of Big Business since there were businesses to call big. Although prospects are grim with the global financial crisis, Poland hasn’t been hit quite so hard and the banking and housing industries are still quite strong. If they confine themselves to cubicles in Warsaw business centres and consume themselves with trading on the Warsaw Stock Exchange everything should be A-OK. Their worlds could collapse if they take a day trip to Radom and go out for a friendly drink. Hockey Moms/Joe Six-Packs: Both of these archetypes are otherwise known as the working class base and are who vice presidential candidate Sarah Palin has been pandering to since she started campaigning on the McCain train in August. The closest approximation of real-world demographics are stay-at-home moms in the Midwest (and Alaska of course) and working class men that get drunk pretty regularly. If any such hockey moms were to move to Poland they would probably be confused as to how unpopular hockey actually is in such a cold country and wonder why there are so few cooking shows and chat programs on Polsat. Joe six-pack would get on the best in Poland as long as he could get used to the nickname Józek flaszka. Satirically subjective prejudgments aside, there is one thing that unites any prospective non-native Polish speakers moving to Poland – navigating the Polish language. 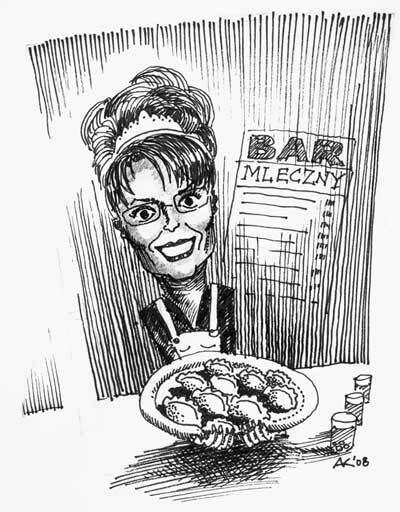 Whether it be Sarah Palin or Michael Palin, ordering a plate of pierogis in perfect Polish (much less trying to discuss foreign policy issues) is a challenge that crosses party lines, transcends politics and universally frustrates.